So what exactly is re-frame? re-frame is a very simple but expressive library for writing single-page applications (SPAs) in Clojurescript using Reagent. Why re-frame, you ask. Because Clojurescriiiipt and Reaaaaaact!!! No really, when functional programming meets reactive programming, it's a new world of possibilities. You'll soon see why. I really recommend going through the brilliant readme that has been put together for the re-frame repo once you're comfortable with the basic aspects that are explained here. This walkthrough is an attempt at simplifying as much as possible the working of a re-frame application. It does not delve into the depths of how re-frame works, but gives you enough information to take that dive by the end. Of course it is necessary that you be familiar with Clojurescript and Reagent (and hence React - duh!). While you need not have written any applications using either, you should at the least know the basic syntax of both. Well then, assuming that's in order, let's jump in! This is a walkthrough and so we need something to, you know, walk through. I thought we could build something together, but Sreenath has built a nice little app that we can use. Go on, have a look at it. Use the app and see what it does. You would probably also be interested in going through the codebase. If you're keen on getting the app running locally, the readme in the repo section explains how to do so. Now, we're going to see how data and control flows through a re-frame app through this example. No, this is not a sing-along of The Jungle Book! Router: Our app needs to be capable of redirecting the various events triggered by a user to the right places. We'll see soon where and how these events are sent and who processes them. Data store: Every app out there is in charge of manipulating and storing data. And since we're talking about a React app, we want a reactive data store - one that tells us when there are changes. Views: This is where we add the visual components of our app. I'm talking of course about the Reagent components. Handlers: We need agents in the field to manage the events that occur on the DOM. Once an event occurs, it gets dispatched to the handler, which then takes some action. But for this to happen, we need to register the events against their handlers in the router (we'll get there). Subscriptions: Once a handler does its thing, there are likely to be changes in the data store. A reactive system is expected to update its view automatically when this happens. We'll see how this happens. So at a high level, here's how it rolls. 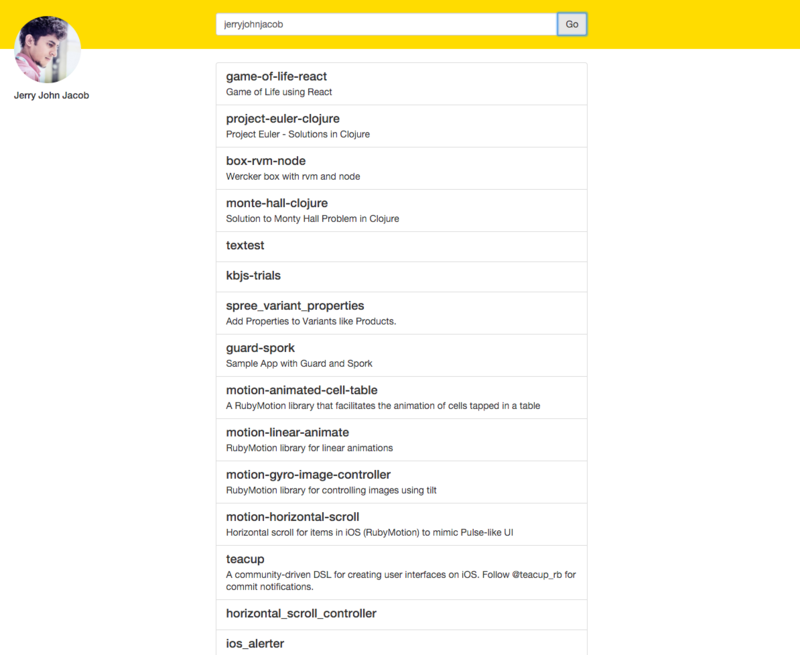 View components get rendered onto the DOM that the user can interact with. These interactions trigger events which are dispatched to handlers. The handlers in turn usually end up mutating data in the data store causing components that have subscribed to those data entries to trigger updation of the DOM. And the cycle repeats. Piece of cake, ain't it? Before diving into further details, there's one more thing we need to know. There are two main sources of code to be aware of. One comprises the Clojurescript files that we'll be writing to power the application logic behind our SPA. These files are located in app_root/src/cljs/app_name/. In our example, it becomes re-frame-sample-app/src/cljs/github_profile/. This method goes through the DOM hunting for an element with the id app. If you look at the index.html file in the static source directory mentioned above, you'll find a div with this id. Once it finds this element, it renders what we're calling the main panel. This seems quite straightforward, doesn't it? Well, let's go through it line by line. The first line of the method is a subscription. Yes, the same one we were talking about earlier. What that line does is that it triggers a 'listener' for changes to an entry in the data store called active-panel. But where's the data store? If you noticed, there's a file called db.cljs. This however does not contain an entry called active-panel. Wait, so where did that now come from? Jeez! Something ring a bell? When we visit this path, an event is dispatched. Events are simply vectors that hold nothing but pure data. In our case, the event has information about the name of the event :set-active-panel and a parameter to support the event, :home-panel. So now what? This dictates that once the event :set-active-panel is dispatched, set the :active-panel entry in the data store to the parameter that got sent in with the event. In our case, the parameter is :home-panel. Hence a new entry gets added in the data store called active-panel with the value :home-panel. Rewinding to our original main-panel method, you'll see that the subscription we have queries this very data attribute (active-panel) in the data store. Visiting the root path caused a change around this attribute. The subscriber is a Reagent component. It picks up the change, resulting in the triggering of the process to update the DOM. Needless to say, the method panels is invoked with the :home-panel argument resulting in the calling of the method home-panel, which can be found in the same file. This returns a Reagent component responsible for rendering the elements we see in the root page. Note that this component is constituted by two other components, namely github-id-input and user-repos-list, both of which are now in the DOM. Phew! So let's have a recap of what happened. The user visited the root path, resulting in the setting of the data attribute active-panel to :home-panel in the data store. The mount-root method invoked at the end of the initialization triggers the rendering of the main panel in the DOM. The main panel component is subscribed to the active-panel data entry and hence ends up rendering the home-panel component. So far, we've seen how a user action of navigating to the root path of a re-frame app is handled all the way until the DOM is updated. Now let's ramp things up a bit and have a look at what happens when a user interaction like a click occurs. You must have already tried using the app and noticed that it displays a list of Github repositories that a Github user has. So how exactly does that work? Well, to be honest, it's quite similar to what we've already seen. While there are other important parts in that method, these excerpts are the primary drivers of the click. As you can see, once a Github id is entered and the button clicked, there is an :on-click handler waiting to pick up the event. This calls the method on-click which dispatches an event named :set-github-id with the parameter @github-id. That parameter is set when a change is made to the input field (you can find the logic for this in the same method). From here, it's the same drill. The event that gets dispatched is handled by the registered handler. It triggers the process to fetch the entered user's Github profile and list of repos, the end result being that the data store gets updated with the newly fetched details, causing subscription handlers to trigger updation of the DOM. Activity For You: Try mapping out the process that happens when this dispatched event generated on click reaches the corresponding handler and how the DOM gets updated at the end of it. We've seen the various constituents of a re-frame app. We've also seen how these units interact with each other to respond to user events and update the DOM. This is of course a very simplified version of things. You should definitely go and read more on the readme on the re-frame Github page. Equipped with the information you have now, you should find it quite easy to understand all that is explained over there. If you have any questions or comments, please write them in the section below.